1. Excavators Handicap at Mohenjo-daro is the presence of groundwater near the surface of the plain. This cut was made to uncover the bottom of the city wall (Brickwork at rear). The work was halted by flooding at a depth of only 15 feet below the plain level. 2. Flood countermeasures taken at Mohenjo-daro included the construction of massive brick embankments to keep the level of the city above ater. A pit (center) was dug down through 25 feet on unfired brick in one such embankment without reaching bottom. These images that show how difficult if not impossible it is to ascertain Mohenjo-daro's age; the water table even 50 years ago was doing great damage to the city's remains and making deep digging impossible. From lead excavator George F. Dales article The Decline of the Harappans (Scientific American, May 1966) where he and Robert L. Raikes, a hydrologist "conducting extensive surveys in southern Baluchistan and the lower Indus valley," proposed a dam-and-lake scenario to explain the city's rise and demise that even if not supported by research since then, also raises important questions around water and water resource management that we know was central to Indus civilization from Punjab through Sindh and Gujarat. 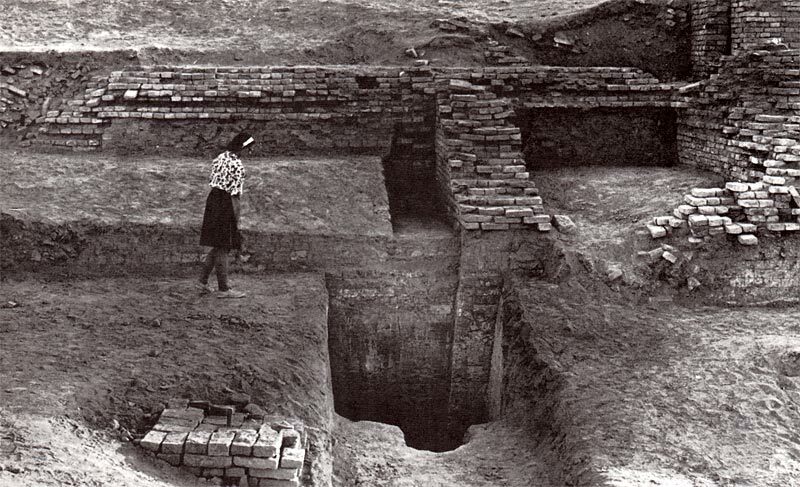 George F. Dales, who led the 1964 excavations at Mohenjo-daro, wrote "The archaeological evidence strongly suggests that large-scale community projects were indeed undertaken at Mohenjo-daro for this purpose [protecting the city from river floods]. As an example, massive mud-brick platforms were erected and faced with fired brick, apparently with the objective of raising the level of of the city safely above lake waters. One such embankment, partially excavated by the expedition is some 70 feet wide and well over 25 feet high . . .. After each immersion the inhabitants of Mohenjo-daro found it necessary to rebuild or reinforce most of the city's buildings. Although they usually rebuilt directly on top of the older foundations and walls, they eventually encountered serious problems of decay and sinking. The ruins today dramatically illustrate the problems they face ." Go to the The Decline of the Harappans article. 2. 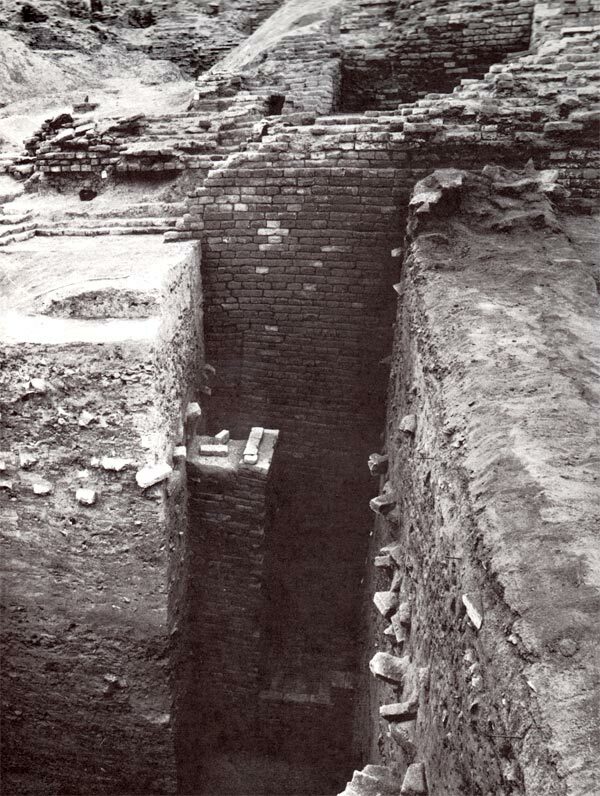 Flood countermeasures taken at Mohenjo-daro included the construction of massive brick embankments to keep the level of the city above water. A pit (center) was dug down through 25 feet on unfired brick in one such embankment without reaching bottom. 3. 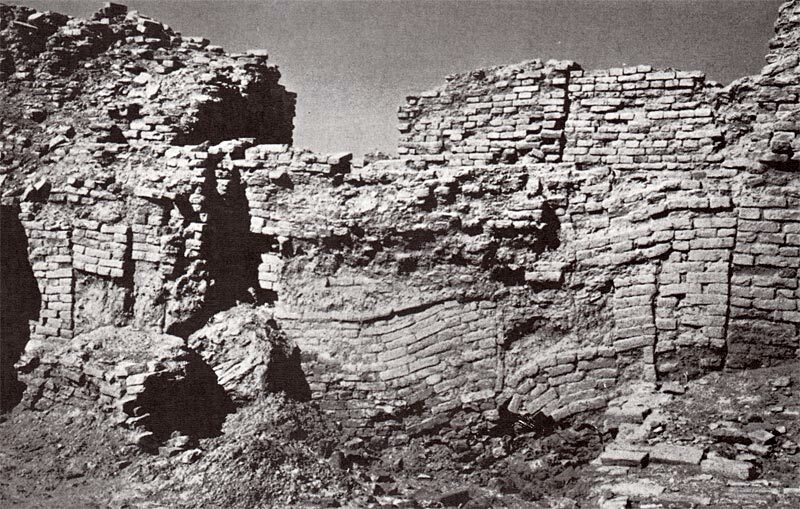 Flood damage at Mohenjo-daro is evidenced by slumping brick masonry (center), which presumably reflects erosion of the city's unfired brick foundations during their prolonged immersion in lake water. The Harappans simply leveled masonry and built on top of it.